Not your traditional Rueben Sandwich. Preheat oven to 350°. Place corned beef in a medium saucepan with pickling spice packet, beer and water. Bring liquid to a boil, reduce heat to a simmer and cover. Continue cooking until fork tender, about 1 hour, 30 minutes. Remove corned beef, discard liquid, and let rest for 10 minutes. Thinly slice against the grain, reserve. Place a strainer in a large bowl with water. Peel the potatoes and place in a bowl of water until ready to use. Grate the potatoes and onion and place the mixture in the prepared strainer. Rinse the potato/onion mixture until the water runs clear. Place the mixture on a towel-lined baking sheet to dry. In a large bowl, combine potato/onion mixture, lemon juice, spinach, egg, flour, salt and pepper. In a large sauté pan, heat oil over medium-high heat. Scoop out 2 tablespoons of mixture. Cook for 1 minute, flatten into pancakes with a spatula. Continue cooking for a total of 2-3 minutes per side, until golden brown. Transfer cooked potato pancakes to a cooling rack on top of a baking sheet to allow excess oil to drain. Place cooked potato pancakes on a parchment-lined baking sheet. Bake for 10 minutes to heat through. 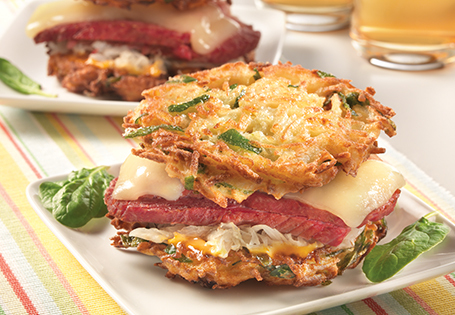 To assemble sandwiches: Place 1 tablespoon of Thousand Island dressing on potato pancake, 1 ½ teaspoons of sauerkraut, 2 slices of corned beef, 1 slice Swiss cheese and top with potato pancake. Place sandwiches on baking sheet, return to oven and cook for 5 minutes. TIP: To shorten prep time, use leftover corned beef.